The RCA2210N is a supplemental pre-recorded Halloween Sound Card for use with the Honeywell MyChime products RCWL2200A and RCWL2205A. 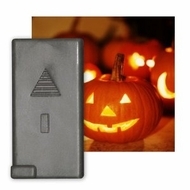 Great for customizing your door chime to the Halloween season, you can greet your guests with festive and scary tunes to match this holiday. The available tunes on this sound card are A howling werewolf sound, a screaming woman sound, a growling animal sound, a sinister laugh, and a moaning ghost.